Extra power and torque are independently measured by TÜV Austria and are approved in the included part approval certificate. The performance data was measured over several runs using different test vehicles and in accordance with standard test methods. Our MAHA dynamometers are regularly monitored and calibrated in accordance with standard expert evaluation regulations. The performance data are determined by a VdTÜV-compliant differential measurement between the serial power of the measuring vehicle and the power consumed. Performance values are standardized according to the standard valid since 1980 in conformity with EWG 80/1269. Older measuring methods that are no longer compliant with the standard (eg according to DIN 70020 or ISO 1585) show about 15% higher performance values. Slippage, which would lead to a false identity card significantly higher performance values, is not included by DTE standards. Manufacturing tolerances and different fuel qualities may result in differences in performance figures. We recommend that you use high-quality fuels such as petrol with an octane rating of at least 98. It’s possible to save up to 15% in fuel costs, however these savings may depend on an adapted part throttle driving style under the same conditions. Multi-Map Technology.Tuning for every sensor. DTE have developed a multi-map tuning technology which can optimise up to nine different channels, all in real time. DTE’s PowerControl is able to control them all, no matter whether it is common rail pressure, boost pressure, turbo pressure, intake manifold pressure or air mass volume. Even the latest generation and most technically demanding engines are effortlessly optimised, all within a multi-dimensional multi-map environment. The driver is able to select between 3 different programs: Sport, Dynamic and Efficiency with 7 power levels each. In addition to PowerControl’s keypad, which DTE introduced in 2014, the new DTE performance of PowerControl X and RX can now also be operated from the cockpit. In addition to PowerControl’s keypad, which DTE introduced in 2014, the new DTE performance of PowerControl X and RX can now also be operated from the cockpit. The chip tuning’s extra power can be easily switched on or off with the smartphone. Simple wiping over the cell phone lets the driver change various programs depending on the driving situation: Sport, Dynamic and Efficiency. And using the integrated and configurable warm-up timer, drivers can decide how long warming up is needed before using the engine tuning form DTE. This feature is not included in your configuration. Please switch to PowerControl X. A highlight of the PowerControl app is the sport instrumentation panel, which shows the engine's relevant performance data in real time. A highlight of the PowerControl app is the sport instrumentation panel, which shows all relevant performance data of the engine in real time. Displaying such data was previously only possible for premium sports car cockpits. The complete package of the PowerControl App also includes an innovative accelerometer that measures the g-forces applying to the vehicle. A DTE engine tuning like PowerControl has the advantage that its installation is very easy. Furthermore, the dismantling back to stock condition is easy as well, e.g. when you change your vehicle. So, you can use your PowerControl tuning box again for your next vehicle. The reprogramming of the used tuning box for your new vehicle is free of charge 1x (PowerControl) and 2x (PowerControl X). Your configuration only includes one single reprogramming. Please switch to PowerControl X to get a two-time reprogramming. With DTE’s PowerControl, drivers have the option to choose their own and fully customizable driving program: Sport, Dynamic and Efficiency. Note: The Efficiency program is only available for PowerControl X. In Sport mode, the engine’s parameters are modified for maximum performance. The vehicle reacts more directly for a more responsive driving experience. The Dynamic mode is a great all-rounder and very well balanced for long distances. The vehicle reacts more dynamically for better agility throughout the rpm range. The Efficiency mode is focused on improving the engine’s fuel consumption. Savings of up to 15% can be achieved. The Efficiency mode for up to 15% better fuel consumption is not included in your configuration. Please switch to PowerControl X. 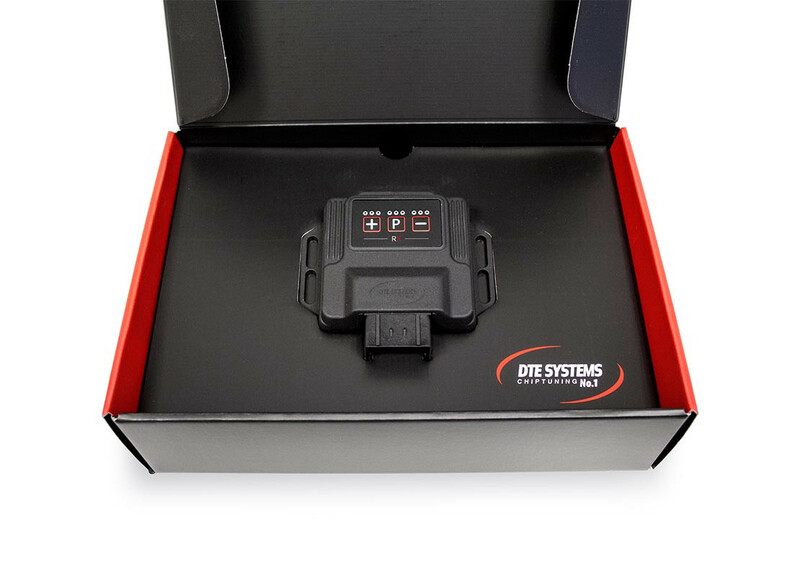 The DTE tuning box PowerControl X has a selectable efficiency mode. This eco program reduces fuel consumption by up to 15%. With an optimized torque, extra power is already available at low rpm’s. Now you can change gears sooner and drive longer in lower gears to save fuel. That's how the tuning pays off quickly. The Efficiency mode for up to 15% better fuel consumption is not included in your configuration. Switch to PowerControl X. For more than 3,600 models and vehicle types, a model-specific TÜV parts approval is included in the PowerControl package. With the parts approval, the required and prescribed acceptance procedure can be done at any test center such as TÜV, DEKRA or a KÜS expert. We provide comprehensive and beyond-the-law guarantees that cover our products. We also provide a 30-day money back guarantee, so you can feel the product in comfort of your own vehicle. Try our quality tuning and look forward to a completely new driving experience. Test the chiptuning system extensively and then evaluate the effects on consumption and driving characteristics - you will definitely enjoy! In development and production, our main focus is on the longevity and durability of our tuning products. Therefore, we generally grant a 2-year manufacturer's warranty (upon registration) on the PowerControl tuning products from the date of purchase. Further details on the provided warranty you can find here. DTE chiptuning box PowerControl is test winner in the 150th anniversary edition of the eurotuner magazine 2016. DTE Systems is a member of the German Association of Automotive Tuners VDAT e.V. - kurz VDAT. Die Tuning-Produkte von DTE tragen das VDAT-Gütesiegel. More than 3,300 vehicle-specific part approvals for proven performance only at DTE Systems. Since 1996, DTE Systems is developing performance tuning products and today the technology leader in Germany. PowerControl and PedalBox are developed, designed and made in Germany in best quality. Our amendment registrations based on § 19.3 StVZO are carried out in co-operation with a partner of KÜS. We highly value our customers' feedback to us, our products and services. PedalBoxThe perfect accelerator pedal tuning for maximum driving fun. DTE does its own R&D as well as production work, due to this it remains the technology leader. On the road performance perfection is the aim of our engineers, that’s why each vehicle gets a precise individual tune. The end result, after all the development work is done, is a high quality product combined with DTE’s know-how and experience. Our newly developing housing is reinforced fiberglass which is perfectly suitable for high heat environments. The integrated high-performance processor works with reference variable modifications and automatic signal speed adjustments. The rugged, 18-pin OEM quality connector plug is widely used in the automotive sector and is capable of handling very high loads. Simple installation, great results, ready…set…go! Installed in a few easy steps! The PowerControl comes with engine cabling and a step by step pictorial fitting guide. With the vehicle specific wiring loom, the PowerControl is installed in a few easy steps. Getting the vehicle back to standard without leaving a trace is just as easy. Install, plug in and go! Simple installation and also removable without a trace! Il PowerControl di DTE consente di guidare a regimi molto più bassi al minuto, riducendo significativamente il consumo di carburante. Le modifiche alle marce possono essere fatte prima e più carburante può essere salvato con ogni giro dell'albero motore. A seconda del tuo stile di guida, è possibile risparmiare fino al 15% di carburante, recuperando rapidamente i costi di investimento. I principali risparmi sono dovuti all'aumento della coppia motrice, con la potenza disponibile nella gamma dei regimi più bassi, il tuo stile di guida si adatta presto, e voilà, i soldi in banca! Why does the PowerControl have keypad program selection buttons? Each DTE performance tuning module has three different programs which are fully adjustable1: Sport, Dynamic and Efficiency. The driver can select a program at the simple touch of a button. 1Deactivation required for TÜV approval. Is the tuning system detectable? No, after the harness and module have been removed, the vehicle is back to its original stock condition and the tuning system is not detectable. 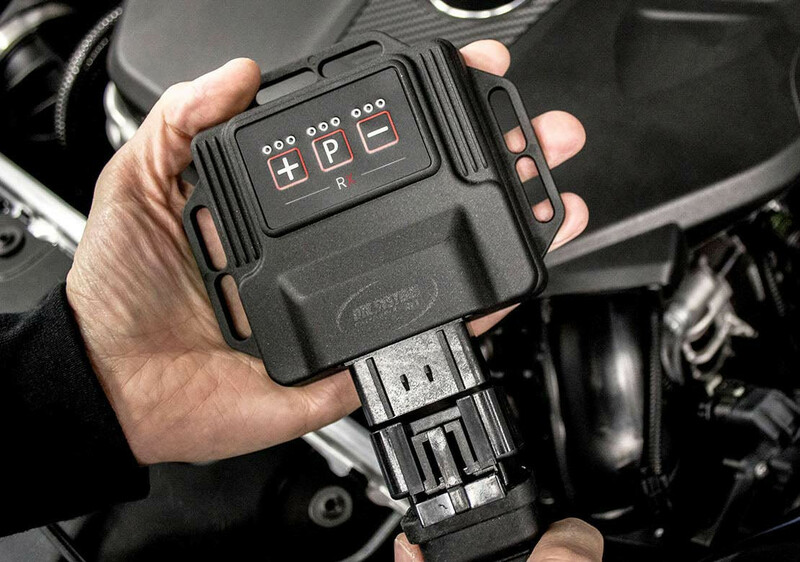 DTE’s PowerControl does not over-ride any engine protective functions and optimises all performance increases within the ECU’s standard working range, therefore no messages are logged in its memory. Yes, an increase in performance needs to be registered, since the installation of an additional control system represents a structural change. Without entry thereof into the vehicles documents by means of partial inspections or individual inspection via a test report, may lead to the loss of insurance cover and the cancellation of the road traffic operating license. Where is the performance system connected? The performance system is connected to some of the main engine sensors, which may include fuel injection, boost pressure sensors, rail pressure sensors (for diesel engines) and intake manifold pressure sensors (for petrol engines) as well as the camshaft’s connections. The relevant signals are assessed, optimised and then sent on to the engine which improves its performance. Do the performance tuning box need a separate power supply? No. As the tuning box is directly connected to the control circuitry of the vehicle there is no need of a separate power supply. Is it possible to increase performance and also save on my fuel bill? Yes, thanks to the engines improved efficiency, fuel consumption can be reduced by up to 15%. By changing gears earlier as well as more frequent driving in the lower rev range, fuel savings are most certainly possible. How long does the installation of the PowerControl take? Our performance enhancements are delivered ready-to-install. A detailed and illustrated step-by-step guide facilitates installation. Clearly labelled components and wiring also make things really easy. This makes the installation of the PowerControl really straight forward and, depending on the vehicles make and model, usually takes no longer than 30 minutes. Do I need to have a permanent Bluetooth connection for the full functionality of a tuning box with app? The optimised performance and torque are always noticeable even without a Bluetooth connection. You would need a connection for i.e. changing programs. Can I transfer my PowerControl to my new vehicle? 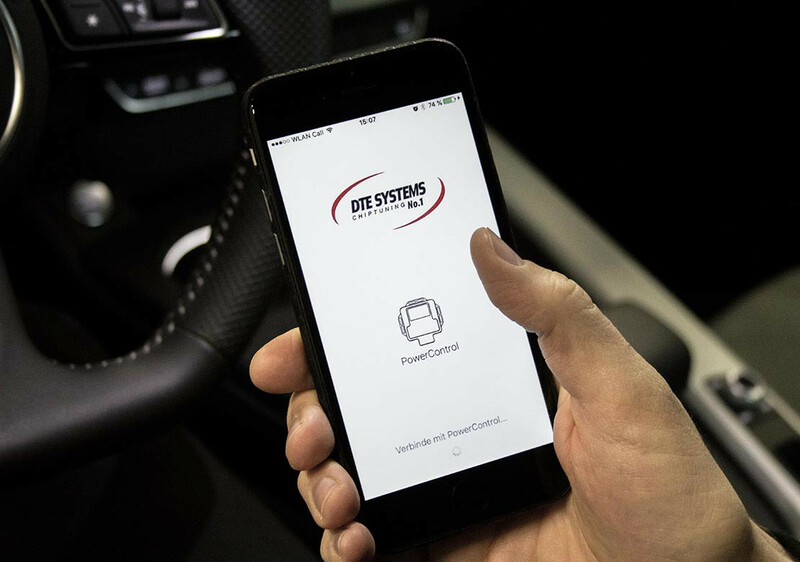 100%, with a quick reprogram of your existing module and possibly a harness change, you can transfer your PowerControl to your new vehicle, and at a fraction of the cost of a new system. You can send it in for us take care of the conversion for you or visit our HQ and let us do the rest. Please note: The new engines technology should be compatible with that of the current systems. Do I need to report my insurance? What about my vehicle warranty? Can I still wash my engine? Yes, the all-over epoxy resin coating of DTE’s high performance tuning PC boards ensures excellent durability and the best possible protection against moisture. Under Engine Protect +, DTE introduces a brand new series of industry leading security standards. These continuously monitor engine signals and protect all the connected sensors which guards against ECU overload. Do the engines emission values remain unaffected? Yes, a major advantage of DTE’s current auxiliary control unit, is its compliance with the statutory and vehicle emission values. The engines combustion is improved in all operational areas which means that the fuel is used 100% efficiently. This also means that DTE can increase the performance of vehicles which aren’t fitted with diesel particle filters without any concerns. Compliance with the engines exhaust gas values is confirmed by the vehicle-specific parts certificate. Does the ECU’s protection functions remain intact? Yes, the protective functions of the engine management system are always maintained and the vehicle is fully diagnosable. My vehicle already has high mileage. Will I still benefit from an increase in performance? If a vehicle has been well maintained and serviced regularly, or even if it runs well but has high mileage, still makes it a perfect candidate for our performance enhancements. Do you offer chip tuning for motorcycles? No, as a manufacturer of performance enhancements, our focus is on the optimisation of motor vehicles, commercial vehicles, tractors and boats. Does the increase in performance have an impact on the vehicle’s tax? No, due to the fact that vehicle’s tax is determined by the engines displacement and its relevant pollutant class, which remain unchanged for all usual engines by the DTE’s performance systems, means that the vehicle remains in its relevant tax bracket. In case of your individual engine, please contact us. My car has an automatic gearbox, will my vehicles performance still increase? 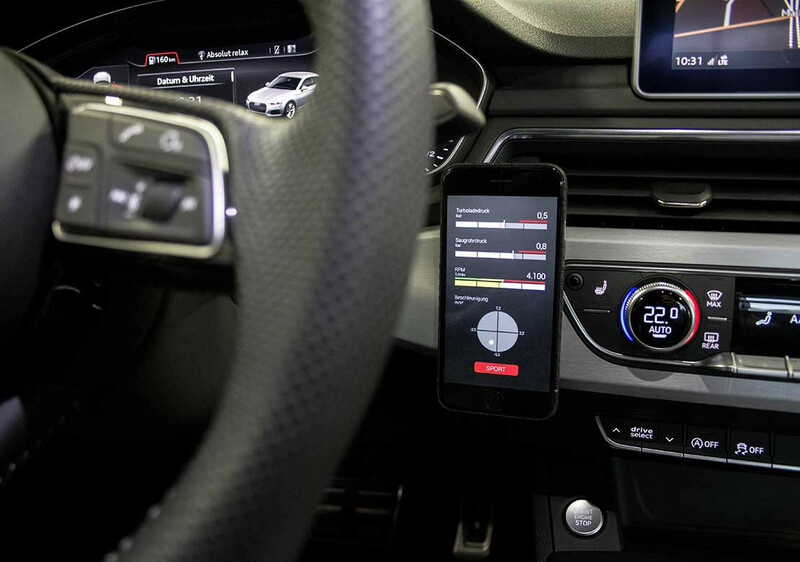 Yes of course, DTE’s PowerControl can also be used on vehicles with automatic gearboxes, dual clutch transmissions (e.g., DSG), or semi-automatic (e.g., tiptronic). Is it possible for my car to smoke excessively? 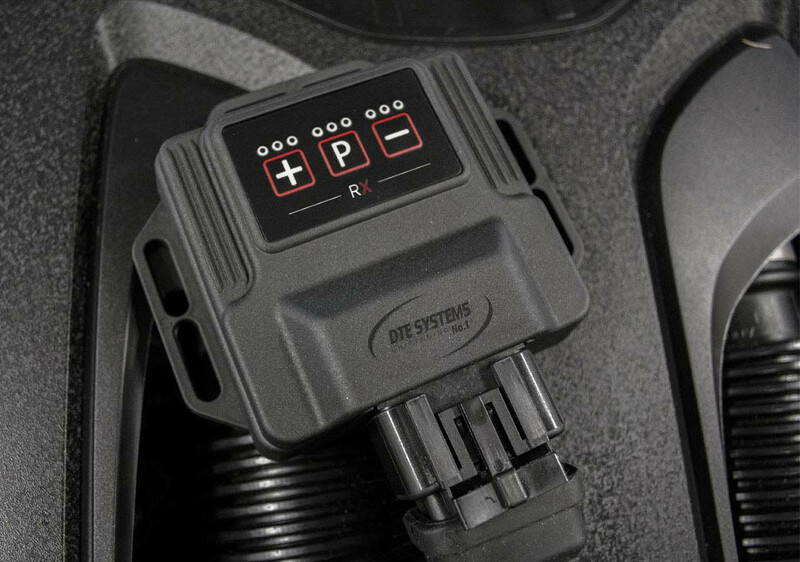 No, DTE’s PowerControl optimizes the air & fuel ratio and not only the amount of fuel injected, but also the quantity thereof as well as the AFR’s (air to fuel ratio’s). This ensures a balanced air to fuel ratio throughout the entire RPM range as well as very low smoke emissions. Compliance with emission values are also certified within our parts certificates. Can DTE’s PowerControl be turned ON/OFF? Yes, simply via the keypad, DTE’s PowerControl can be switched on & off as needed. Just send us an email to meinung@dte-systems.de. We are also happy to get your opinion on Google+ or via eKomi. We are only satisfied when you are excited. And if something is not as you like, our Service team is happy to help. We are constantly receiving feedback from the independent review portal eKomi, via email, social media and our customer surveys. Get an overview on our customers' opinions on this page. Very good communication with the customer. All inquiries will be answered quickly with a solution. That's service! Good support for self-installation, system functions, better performance with low fuel consumption. This is already my second tuning chip. At the 1st driven over 150,000 km, all the best. Significantly more acceleration, consumption minimally reduced. Agreed installation date, staff very friendly, then test drive, all built great, paid and ready. Always again. I was at the company and the installation was without problems. A test drive then showed the subjective performance boost. After a year with the box my fuel consumption has not increased (fuelbook logging). So all is well! Product is top! It delivers what it promises! Was very satisfied with the fast delivery, and I also was very well advised by a technician over the phone and could therefore install my components without problems in my vehicle. I now know my car barely. I never thought that it works so well. Will naturally recommend it. I use DTE Systems products already over 7 years. Always have always received exhaustive information, regardless of which contact I have chosen, phone or mail. The products PedalBox and Chiptuning in my opinion are the best you can get on the market, the products have never let me down and do what they promise. Expert advice, fast shipping and the quality of products (chip and pedalbox) I can judge well as a former car mechanic. I use both and the difference in acceleration dynamics and performance improvement is tremendous. The chiptuning and the pedal box harmonize together perfectly. I'll also need 1 - 1,5l less diesel. My vehicle has almost a motorsport feeling and I can not imagine driving without them. Great company! I deliberately chose a tuning box of DTE Systems, because the increase in performance remains in a realistic magnitude and a certificate of conformity was included. The installation was relatively easy. Just as the acceptance by the TÜV. Was actually quite happy with my performance. However I lacked in some situations more pressure out from below. After installation of the box, the torque increase already in the lower speed range is appreciable. The fuel savings are in my case about 0.5l per 100km. The default setting of the box has not been altered by me. After 2000 km so far there were no problems. The shipment of DTE Systems is very fast. The service is very good, although I hardly had to use it. The PedalBox is installed within easy reach of the driver. Faster acceleration with zero lag, all thanks to DTE’s accelerator pedal tuning module. The PedalBox has 3 programs: Sport, Sport Plus and City, each of which can be fine-tuned, with more than 21 settings for our customers to choose from. The Pedalbox simply connects to plugs on the accelerator pedal and is ready for use in no time! Multi-Map Technology. Tuning for every sensor. DTE have developed a multi-map tuning technology which can optimise up to five different channels, all in real time. Whether it be common rail pressure, boost pressure, turbo pressure, intake manifold pressure or air mass volume, DTE’s PowerControl is able to control them all. Even the latest generation and most technically demanding engines are effortlessly controlled, all within a multi-dimensional multi-map environment. The driver is able to select from 3 different programs: Sport, Dynamic and Efficiency. Adaptive Sensor System. Intelligent performance increase on driver's command. Auto Adjust function. Adjusts automatically to driving behavior. This innovation allows DTE’s tuning products to learn the unique characteristics of your vehicle. During a short ‘learning’ phase, the chips memory function records the engines injection cycle data and optimises the reloaded maps accordingly. Standard vehicle tolerances are taken into account and an optimal tune is achieved – all without any complicated driver input. Engine Protect+. Added safety and protection for your car. Legal Notice. Before starting up, inform yourself. The installation of an additional control unit represents a structural change that can result in the loss of warranty and/or loss of insurance cover without registering a parts approval certificate in the vehicle documents. The represented product comes with a part approval which makes registration easy. Warranty claims against the seller and any warranty claims against the manufacturer may be omitted through an increase in performance via chiptuning or an additional control unit. Before usage outside Germany please inform yourself about applicable national road traffic laws which might restrict the usage to private roads, race tracks or offroad. We will be glad to provide you with detailed information.